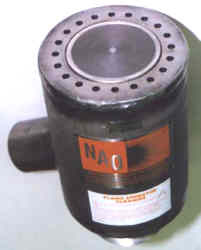 NAO flame arrestor burner used for VOC or vapor control of combustible streams, i.e., benzene gasoline. The arrestor is shown with an air jacket for complete & smokeless burning of the vapors and also to provide cooling for the arrestor grid. NAO hydrogen flame arrestor burner used for chemical and process applications. 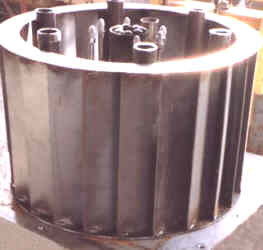 The arrestor is shown with an water jacket for cooling of the arrestor grid to prevent flashback. This type of arrestor burner is also used for ethylene oxide (EO or ETO) burners for the pharmaceutical industry. NAO flame arrestor burners used for NCG (non-condensable gases) in the pulp & paper industry. 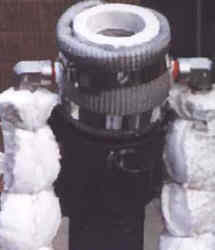 This unit shown is a forced draft FOUR stream waste burner -- including liquid turpentine and NCG vapors.